When looking for TPD insurance to support yourself and your family in the event of total and permanent disablement, take some time to shop around. Comparing disability insurance quotes online can help ensure that you and your family are financially protected; should you be unable to work due to a sickness or accident. Gather TPD insurance quotes from Australia’s leading life insurance companies and compare the benefits and features provided by each company, while keeping in mind how much cover you need and what you can afford. Use our step-by-step guide to determine which company offers the best TPD policy for your circumstances. What does TPD stand for? The sight in one eye and the use of one limb. And because of this above loss you are unable to work in your Own or Any occupation. TPD insurance provides a once-off lump sum benefit should you be unable to work because you’re totally and permanently disabled. TPD cover is designed to help you and your family pay medical expenses and outstanding debts, as well as provide financial support so you can modify your home to accommodate your new lifestyle. 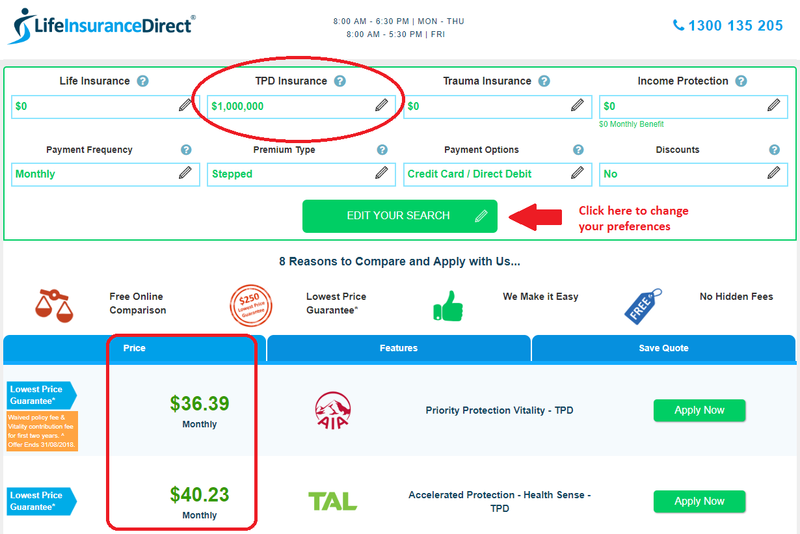 How does TPD insurance work? In exchange for paying a monthly or annual premium, you’ll be covered for sicknesses and injuries resulting in your total and permanent disablement that prevents you from ever working again, either in your Own or Any occupation depending on the disability definition you choose. 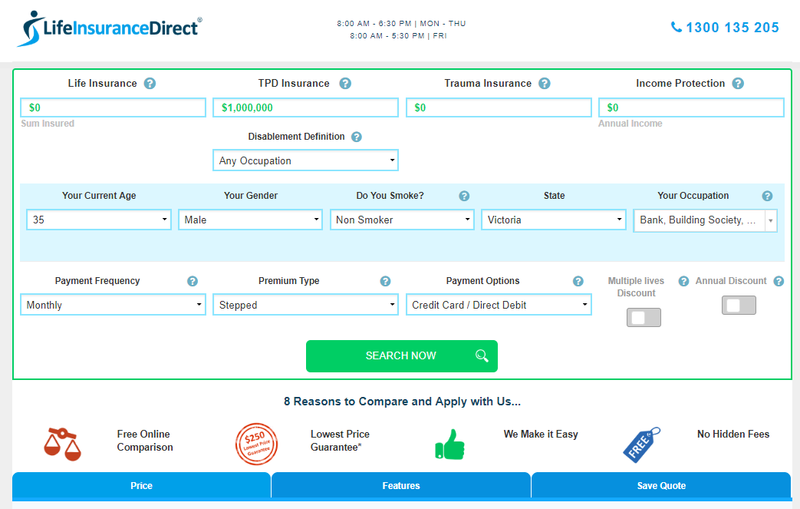 With Life Insurance Direct you can easily compare TPD premiums and features side-by-side from some of Australia’s leading insurers by completing the below steps. Choose the amount of cover you want and provide some personal details, like your gender, age and occupations. For example, let’s assume you want $1000,000 worth of TPD cover for a 35-year-old, non-smoking male bank clerk living in Victoria. After providing your details and clicking the ‘compare quotes online’ button, you’ll be directed to a quote specifically created to suit your unique requirements. You can further refine your search and choose between level or stepped premiums and whether you want disability insurance for your Own or Any occupation. 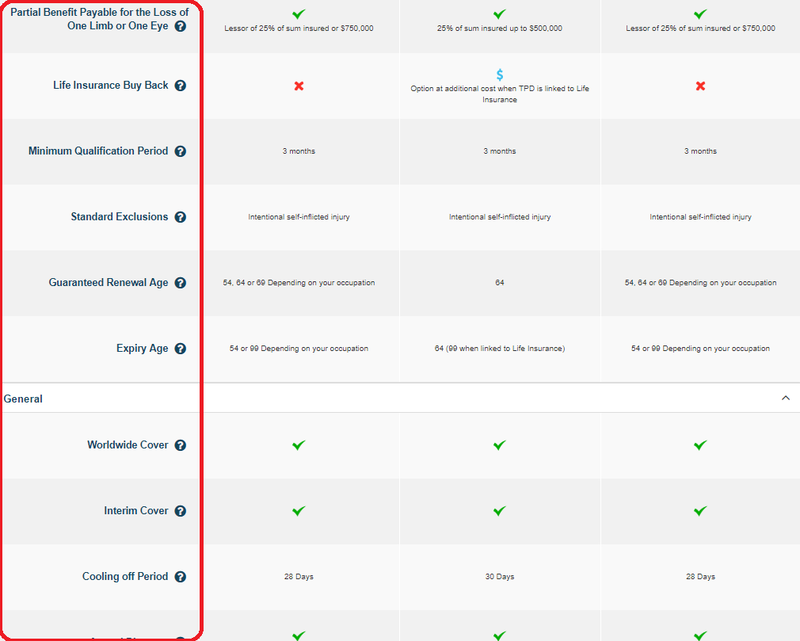 Now you can review which policy offers you the features and benefits you want, at a price you can afford. Own occupation: The benefit is payable when you’re permanently unable to perform the duties of your own occupation. Any occupation: A lump sum is paid when you’re unable to work in any occupation for which your education, training or experience is reasonably suited to. Home duties: Pays a once-off benefit when you are totally and permanently disabled and can no longer return to your regular domestic duties, like cooking family meals. Modified TPD: A sickness or accident resulting in your inability to take care of yourself, meaning you can’t perform at least 2 of the 5 activities of daily living. For example, bathing and dressing. Request assistance from a specialist to help you choose the right TPD definition for your circumstances. You can choose to either buy a TPD policy on its own or combine your TPD cover with your life insurance or critical illness insurance. When linking policies, you’ll only pay one premium. However, when you claim on one cover type, the insured amount of the other types will generally reduce by the amount claimed. 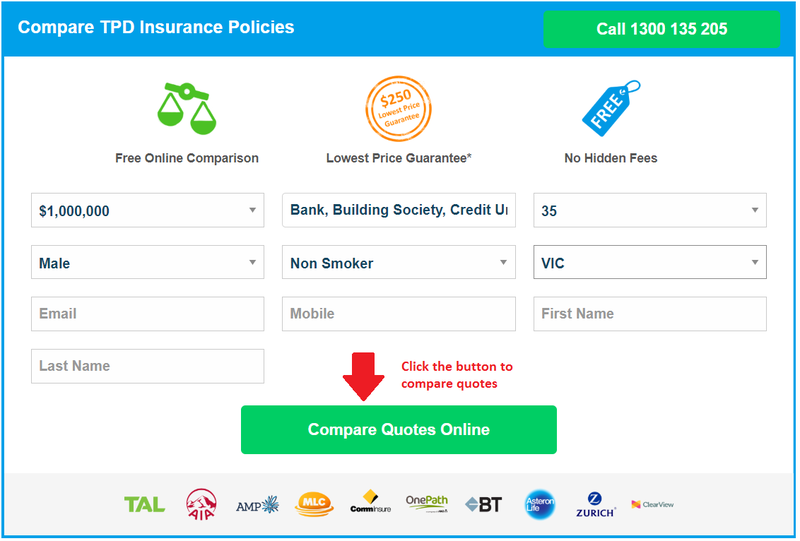 Make sure you know which premium structure you want when comparing quotes. Level premiums: Starts off more expensive, but is generally more affordable in the long-term because it does not increase due to your age. Stepped premiums: Cheaper at the start of your policy but increases every year. Hybrid premiums: Starts on a higher than normal stepped premium structure, but then converts to level premiums at a predetermined cost. The benefits and features included in your quote also plays an important role in the value each policy provides. In the below example, both AIA and TAL pays a partial benefit in the event of losing one limb or one eye. However, AIA pays up to $750,000 for this benefit, whereas TAL only pays up to $500,000. 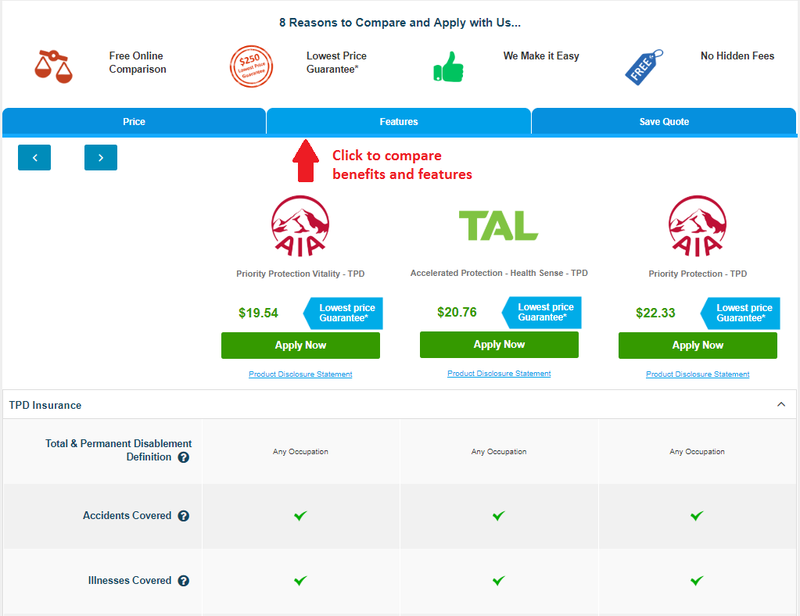 On the other hand, both AIA and TAL provides the Life Insurance Buy Back option for an additional fee. Another feature to consider when comparing TPD insurance policies is the minimum qualification period, which is the length of time an insurer requires you to be disabled before you can lodge a claim. Waiting periods differ from insurer to insurer, usually between 3 to 6 months. Generally, TPD policies will not pay a claim when total and permanent disability is directly or indirectly the result of an intentionally self-inflicted injury. Every insurer has different underwriting guidelines, some with more exclusions than others. Be sure to carefully review the complete list of exclusions of the policy you’re considering by reading their product disclosure statement (PDS). Last, but not least, compare the cost of the disability cover you’re comparing. There’s no use in purchasing a policy with a long list of benefits and features if you’re not able to afford it in the long-term. The premium you’ll pay for your disability benefit is usually determined by the cover amount you want and various other factors, including your age, gender, occupation, smoking status, and the built-in benefits and optional features listed in your policy. What is double TPD insurance? When you combine your life insurance policy with TPD cover, the Double TPD benefit allows you to reinstate your full life cover amount after the reduction of a full TPD claim being paid. Do I need TPD and income protection insurance? Both TPD and Income protection provides financial support when you’re unable to work because of an accident or sickness. However, they differ in how they payout and for how long. TPD pays a once-off lump sum benefit when you’re generally unable to work in your Own or Any occupation. Income protection pays a monthly benefit, generally up to 75% of your regular income, for a benefit period of your choice; typically, 2 or 5 years or up to your age 65. If you or your family are reliant on your income to pay the bills and you do not have enough money saved for medical expenses and future living costs should you become totally and permanently disabled, then you probably need TPD cover. Which illnesses and disabilities are covered by TPD Insurance? Any accidents and sicknesses that solely result in you being made totally and permanently disabled as per the policy definition will generally be covered. However, this depends on your insurer and the definition you’ve chosen. Total and permanent disablement generally constitutes a valid claim when you’ve suffered the loss of sight in both eyes, use of two limbs or sight in one eye and the use of one limb. What is partial TPD cover benefit? A partial benefit is payable if you suffer a specific loss, for example, the loss of one limb or the loss of sight in one eye. Cancer is not usually listed as one of the illnesses covered by TPD, because many people are not deemed totally and permanently disabled when diagnosed with cancer. However, it is possible that you may become totally and permanently disabled as a result of cancer, therefore potentially becoming eligible for a payout. If you want to be covered for cancer-specific diseases, you generally need to purchase trauma insurance. Total and permanent disability premiums are generally not tax deductible to policies personally owned, but some TPD policies purchased through super may be tax deductible to the fund. TPD or Income Protection which is best or should I have both? Everything you need to know to protect your income and your family’s financial future. Own Occupation Total and Permanent Disablement cover provides protection if you can no longer work in your Own Occupation. Are TPD Insurance Premiums Tax Deductible? Yes, TPD insurance premiums are tax deductible when an any occupation total and permanent disablement insurance policy is owned by your super fund. Not sure about Modified TPD? Learn more about this policy including when it is available, when to consider it and how you can use your benefit!